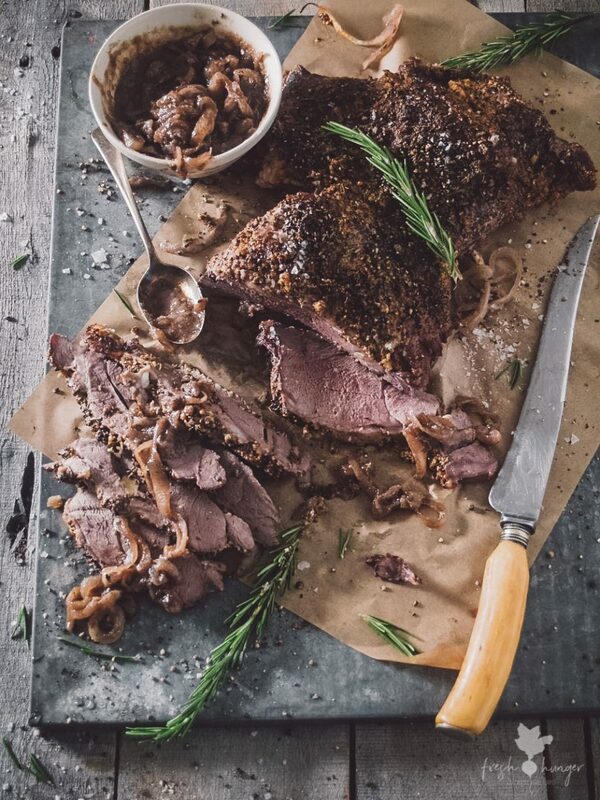 Encrusted in stoneground mustard, fresh rosemary, lots of pepper, sea salt flakes & served with a port & onion au jus, Peppery Roasted Mustard Lamb is simple to make, uses only a handful of ingredients & delivers bold flavors. My dear husband shared his man flu with me so this will be quite a quick post today as I feel positively horrible & need to be horizontal. 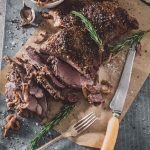 Many people here in America think of lamb as being Greek, but it’s eaten by most cultures around the globe because it’s small & easier to farm than beef: using on a fraction of the land, requires less food & less time for growth & consequence slaughter. Having been raised on lamb for me it’s very Australian. It strikes me funny how few people have eaten it here in the Midwest where I live. Easier to digest than beef, lamb also has infinitely more flavor. Using the leftovers from a previous lamb roast, I made a shepherd’s pie the other night. My husband loved it. I remarked it would be hard achieving so much flavor using beef because I put only a few ingredients into the pie. 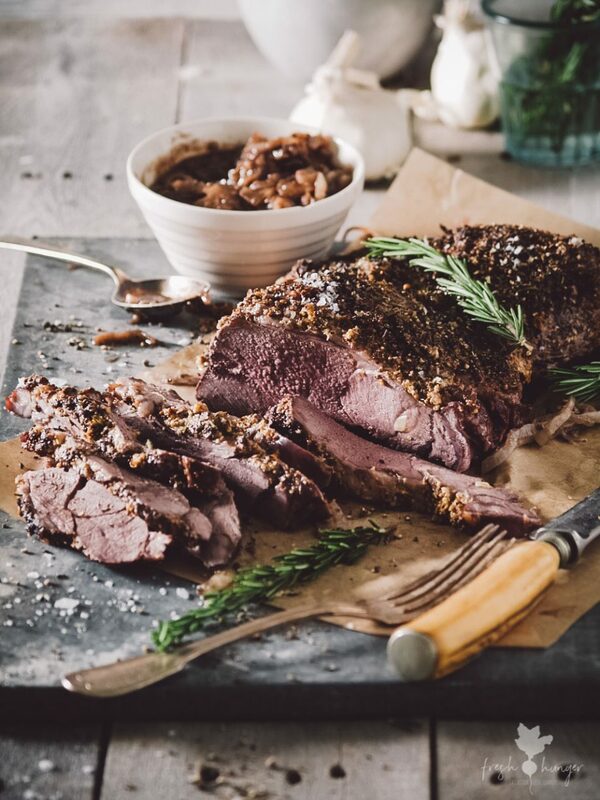 That’s the beauty of lamb – it’s big on flavor making it perfect to stand up to bold flavors such as curry & other spices but because it is so flavorful it doesn’t need a plethora of ingredients to make it taste brilliant. So it’s a win-win. I roasted the lamb on a bed of onions. Then when cooked, I covered it with foil, allowing it to rest before carving it while I made a pan sauce with some port wine – more an au jus than a gravy. It’s as good cold on a sandwich or in a gyro as it is warm. Serve leftovers with a salad or you can freeze any leftovers to make a pie, that’s what I tend to do. Remove the lamb from the fridge 30 minutes before cooking. Preheat the oven to 375°F. Layer onions in a roasting pan. Place the lamb on the onions, opening the lamb out flat with the fat side facing up. Poke 16 holes over the lamb using a sharp paring knife. Press a piece of garlic into each hole. Combine the mustard, rosemary, salt & pepper together in a small bowl. Rub this mixture over the top & sides of lamb. Drizzle with a little olive oil. Pour broth into the roasting pan. 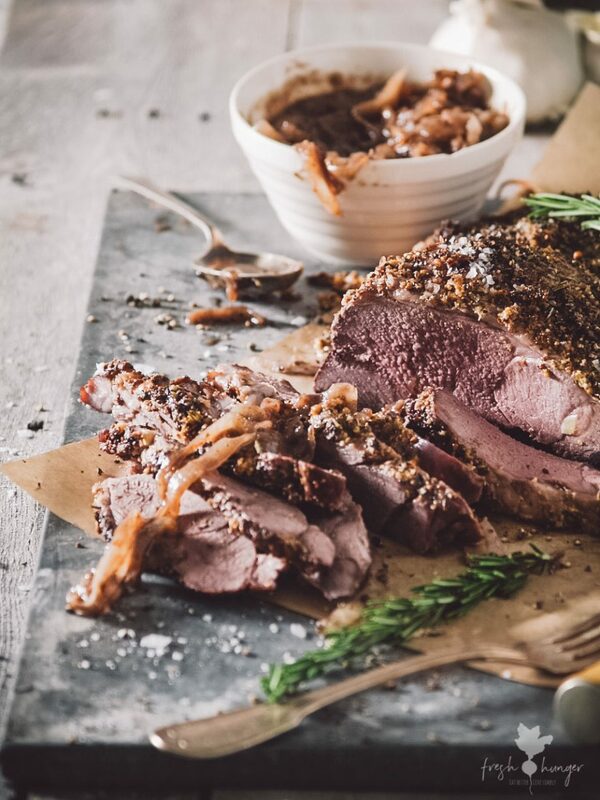 Roast for 1 1/4 – 1 1/2 hours or until a meat thermometer reads 145F for medium (or juices run clear when poked with a small knife into the thickest part). Or lamb is cooked to your liking. Remove lamb from the pan & cover to keep warm. Place roasting pan over medium-high heat. Add port & cook, stirring occasionally, until port & juices have reduced by half. 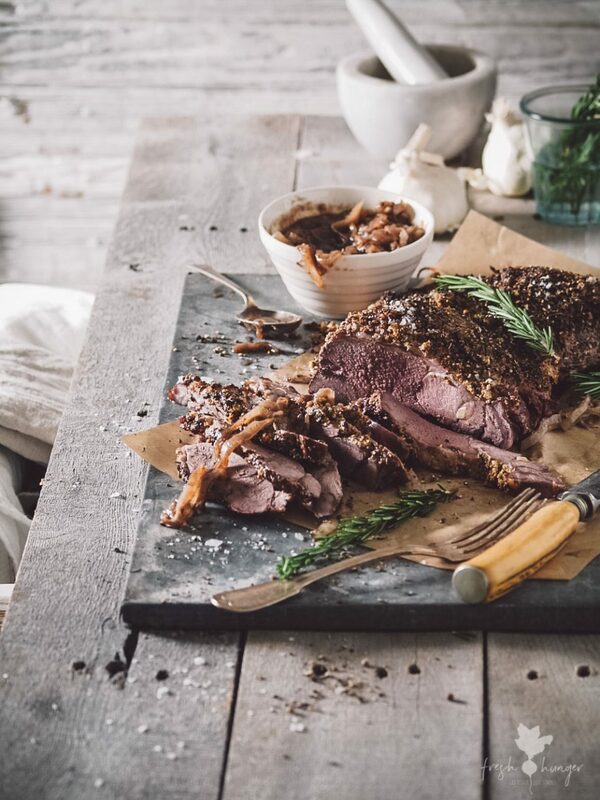 Slice lamb & serve with port & onion au jus. I just received my latest lamb order and the freezer is full of possibilities. I’m going to make this one for sure and try the shepherds pie too. Thanks Voni! You get a lamb order?? Ugh, I’m so jealous. I used to when I lived in Canada but I’m currently living in a culinary desert. People here haven’t even eaten lamb. Thank god for Asian, Indian & Middle Eastern markets here.